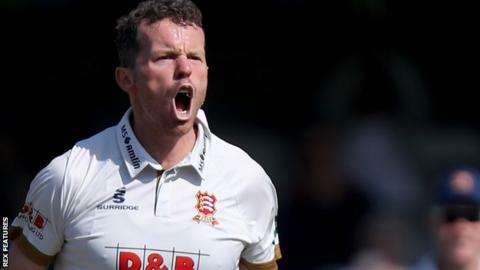 Australia pace bowler Peter Siddle has signed a two-year deal to be Essex's overseas player in 2019 and 2020. The 33-year-old has had two spells with the reigning county champions this season. "There is a wealth of talent in this squad who are hungry for more success," said Siddle, who has taken 211 wickets in 62 Tests for his country. "I am thrilled that I can join them for a further two seasons and be part of it." Alastair Cook, who is retiring from international cricket at the end of England's ongoing Test against India at The Oval, agreed a new three-year deal with Essex earlier this week. "We've had some really great battles in the past and it's going to be fun to play on the same side as him rather than against him," added Siddle. Meanwhile, Essex have released veteran Pakistan-born all-rounder Ashar Zaidi and academy graduate Callum Taylor. Zaidi, 37, specialised in limited-overs cricket but was also part of the Essex side that won back-to-back County Championship titles - Division Two in 2016 and Division One in 2017. Head coach Anthony McGrath said: "Ashar has been an important part of the squad. His ability to strike the ball long and hard was special to watch."